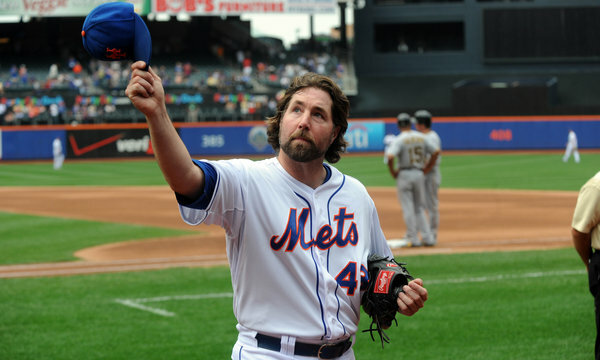 R.A. Dickey makes my day. As the regular baseball season ended, I posted about two good things I thought could be said about the Mets' otherwise miserable run this year. One of these was R.A. Dickey's twenty wins, the first for the team since Frank Viola's 22 years ago. Now Dickey has capped that achievement by winning the National League Cy Young award. He is only the third Met--the others are Tom Seaver and Dwight Gooden--to have that honor. Dickey is my kind of guy. His pitch--the knuckleball--relies on finesse rather than brute strength. He came to the Mets not as a heralded superstar but as a journeyman who might find a place in the rotation. In rare fashion, he improved after donning the blue and orange. He's also an intellectual. Yogi Berra was once asked if there were any intellectuals among his Yankee teammates. He offered one name, saying he once saw this player "reading a book that didn't have any pictures." Dickey was an English literature major at the University of Tennessee, reads avidly, and was inspired by Hemingway's The Snows of Kilimanjaro to climb that mountain in order to raise funds for an organization that serves victims of human trafficking in India. Last weekend, thanks to the kindness of a neighbor, my wife, daughter, and I were able to spend a relaxing weekend at a house (photo above) in the Beaverkill Valley, between Mongaup and Touch-Me-Not mountains, in New York's Catskill region. The falls of the Beaverkill. A small marsh in a meadow. Whitetail deer in the meadow behind the house. Fungi and moss on a log. Postscript: Although there was some evidence of the recent transit of Hurricane Sandy through the region, in the form of freshly downed tree limbs and broken trunks, there was also much remaining from last year's Hurricane Irene, which hit the Catskills much harder, as witness the fallen logs below. Following part of the course of a small stream that flows down a steep hillside into a small pond, which in turn drains into a continuation of the stream that flows into the Beaverkill River, a renowned trout fishing destination in the Catskill region of New York State. I regret the small spot on my camera lens, which I hope is not too distracting. I'll be posting still photos and text about our weekend in the Catskills in a day or so.